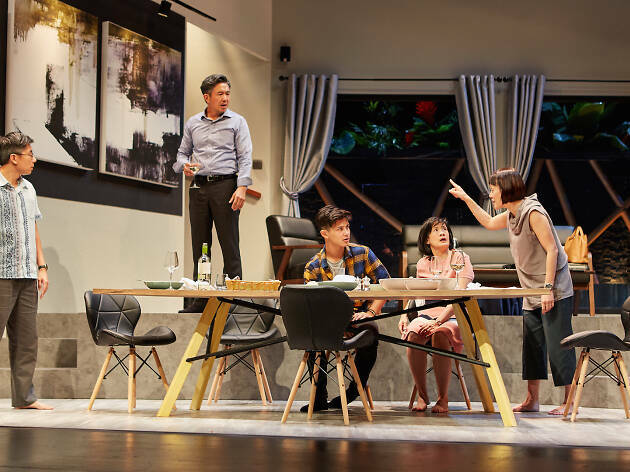 With Singapore having one of the highest rates of bullying in the world, there’s never a more relevant time for the staging of Late Company than now. 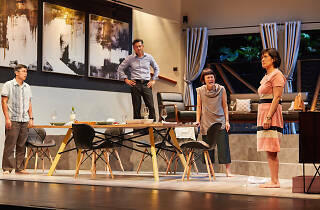 Written by Canadian playwright Jordan Tannahill as a response to a real-life tragedy, the play introduces mourning couple, Michael and Debora, who seek closure after their son Joel’s death. As they anxiously await the arrival of their guests Bill, Tamara and their son Curtis, they prepare themselves for a night full of blame, shame and retribution. Cue the gasps – Curtis also happens to be the one responsible for Joel’s suicide. 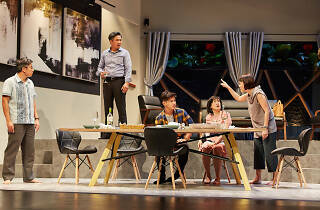 The eye-catching set is furnished with contemporary art pieces and stylish décor as an apt reminder that the story takes place within the present. There is subtle symbolism that subconsciously reminds the audience of the baggage of those who are continuously in mourning such as the unattended dining chair and the trickling of water. 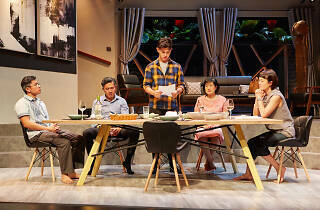 The stellar cast, including the award-winning Janice Koh, TV maestro (and one-half of Pangdemonium’s artistic directing duo) Adrian Pang and his son Xander, marvelously embodies the different perspectives of the heartbreaking incident – both attached and detached – bringing audiences along for a rollercoaster ride filled with waves of laughter and tears. 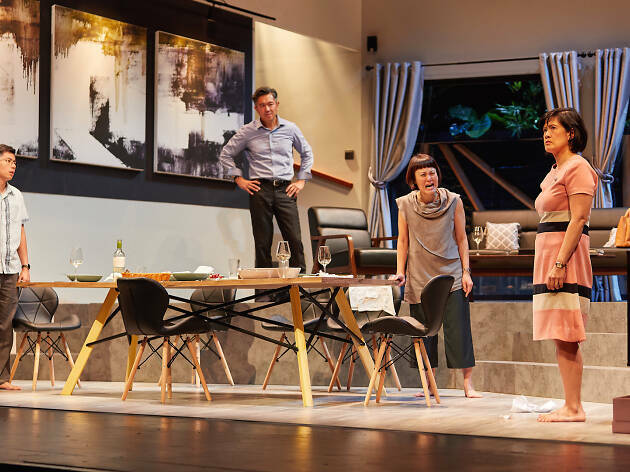 The entire play only comprises of one scene but the power of the tension between the characters and the situation makes it far from tiresome. Every joke and hard-hitting moment allows the audience to cut the tension with a laugh or some waterworks. However, admittedly some moments were unintentionally awkward, garnering a chuckle or two when it was meant to be serious. 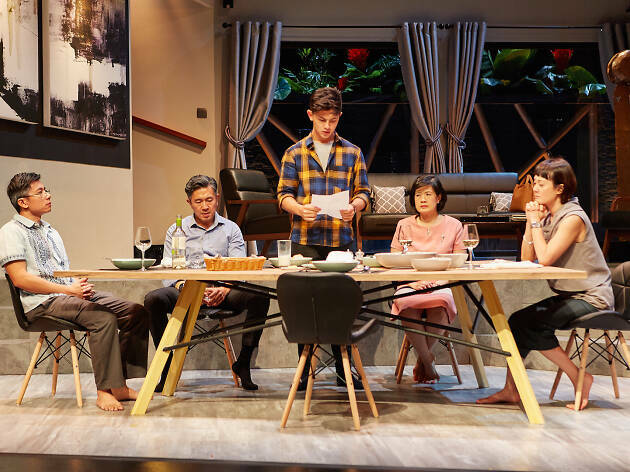 Though the play revolves around the negative impacts social media can have on individuals, it also reminds them of how if used correctly and appropriately, the platform can be beneficial and a source of happiness and joy for everyone. A far cry from a fictional drama, the play will have you internally debate with yourself about the realities and consequences of your actions on social media. Don’t expect to skip out of the theatre with glee.